Giving back to the community that provides students with an education and the opportunity to play basketball is Coach Adjalma “Vando” Becheli’s goal when he takes his team to the area schools to meet the students. “We started this tradition when I became head coach and my team loves to interact with the students,” he said. Head women’s coach Chelsey Warburton echoed Becheli’s thoughts. “It is a great opportunity for our student athletes and the youth to interact as well as discuss the importance of working hard in the classroom and on the court. “Our team enjoys the fun atmosphere at the schools and they are happy to help and support the reading programs,” she said. 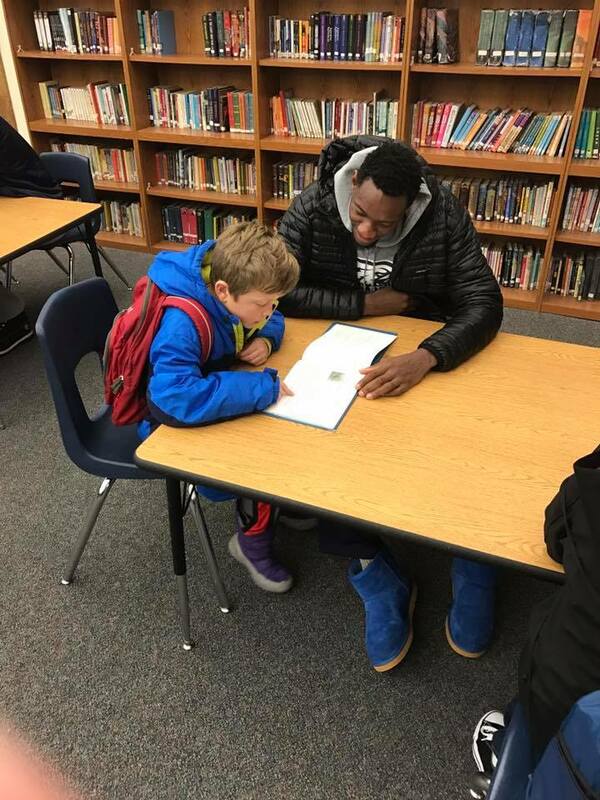 At Creekview Elementary school, Becheli’s team arrived at 7:30 a.m. and each team member read to a student for an hour. We have a 7-foot player from Africa and the students are awestruck at his height, he said. The classroom had a rug with all the countries drawn on it. Each basketball player pointed to which country they were from. This year’s Eagles have six players from throughout the world including Kristupas Totoris from Lithuania, Nico Gonzales from Spain, Andy Isokpehi from Nigeria, Nicolas Schapochnik from Brazil and Nico Rojas from Columbia. Coach Becheli is from Brazil and is in his ninth year living and coaching in the United States. The team visited Mont Harmon Middle School Jan. 26, and brought autographed basketballs to be raffled off to two students. In an auditorium full of 11 and 12 year olds, the team greeted each student and told them how important it is to take school seriously and get good grades. They also had their photos taken with the students. “The students love to meet our team, but in reality, our team loves to visit the schools,” coach said.